A new IMF Tune version is available for download! Version 6 is introducing native support for Forefront Protection 2010 for Exchange. IMF Tune now supports all Microsoft anti-spam engines available for Exchange 2003, 2007 and 2010. Version 6 continues to fully support the Exchange 2003 Intelligent Message Filter and the free Exchange 2007/2010 Content Filter. In addition to these we now also have Forefront Protection 2010. Unlike anti-spam, Exchange does not include any built-in anti-virus protection. When looking at the solutions IMF Tune users are adopting to fill this gap Forefront is clearly the solution of choice. However Forefront also brings its own anti-spam Content Filter which IMF Tune v6 is now embracing. With Forefront support, IMF Tune users now have more choice when it comes to spam filtering. One can choose to employ the free Content Filter included with the Exchange anti-spam transport agents. Otherwise if Forefront is installed, the Forefront Content Filter can be employed instead. Switching back from Forefront to the free anti-spam agents is also supported. In this manner IMF Tune users stay in control. Why use IMF Tune and Forefront Together? IMF Tune today is so feature rich that it gives a significant boost in functionality even when employed with Forefront. Additional spam filters, email moderation from the browser, extensive reporting, and a much more effective configuration interface are the key selling points. Enable Forefront Protection Anti-Spam. This is done either at installation time or from the Forefront Management Console. Restart the Microsoft Exchange Transport Server service to ensure the Forefront Content Filter is completely installed. Install IMF Tune v6.0 Server. Enable the Forefront Protection Anti-Spam. This is done either at installation time or from the Forefront Management Console. Open the IMF Tune Configuration. This will detect and report any problems. IMF Tune v6 is introducing a new configuration category that is most useful when running Forefront. Here we configure how IMF Tune is to deal with emails having an initial SCL -1 rating. IMF Tune processes emails after that Forefront completes its own processing. So IMF Tune starts from an initial SCL that can be anything from -1 to 9. 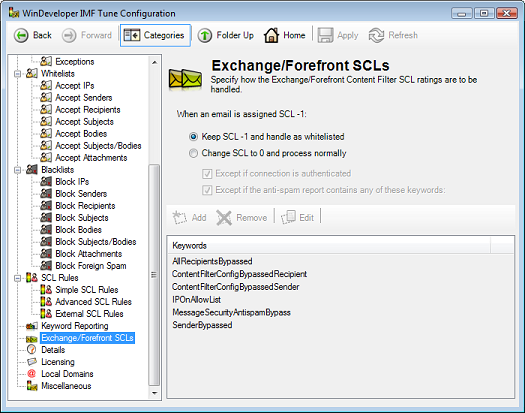 Exchange 2003 IMF and Exchange 2007/2010 Content Filter assign SCL -1 only when an email matches a whitelist or in case of internal emails. Note that here we are referring to Exchange whitelists not IMF Tune whitelists. For example Exchange provides the IP Accept List. If an email is received from a host whose IP matches this Accept List an SCL -1 rating is assigned. Forefront assigns SCL -1 with less restraint. Indeed, it uses SCL -1 to also stamp emails classified as legitimate by the Forefront Content Filter. This is the case even if the email does not match any whitelist. The distinction between whitelisted emails and emails classified as legitimate through content analysis is useful to IMF Tune. When IMF Tune finds a whitelisted email (SCL -1), no blacklists or SCL Rules are applied. So with Forefront's rating system we end up with many more emails bypassing blacklist processing. Let's say our Organization wants to blacklist a mailing list that sends out daily jokes. This is an opt-in mailing and Forefront correctly classifies these emails as legitimate, possibly assigning SCL -1. The IMF Tune blacklists will be bypassed unless we change the settings at the Exchange/Forefront SCLs category. IMF Tune can be configured to further analyze emails having an SCL -1 rating. Normally the goal is to distinguish between emails that are explicitly whitelisted and emails classified as legitimate by Forefront content filtering. This header gives details on how the SCL rating was arrived at. For example if an email matches the Exchange IP Allow List, the report will contain the keyword IPOnAllowList. Other keywords are used to identify other Exchange built-in whitelists. To enable this functionality go to the Exchange/Forefront SCLs category. In this mode IMF Tune won't apply any blacklists and SCL rules to emails having an SCL -1 rating. This is the correct behaviour when employing the built-in Exchange 2007/2010 Content Filter. With this setting IMF Tune is allowed to change the initial rating from -1 to 0. IMF Tune is then able to process the email normally applying whitelists, blacklists and rules to reach the final SCL rating. Following these checkboxes, we have the keyword list to be tested against the anti-spam report header. This is initialized with a set of standard keywords obtained from official documentation and through testing. Thus WinDeveloper recommends caution when modifying this list. The IMF Tune v6 server can be installed directly on top of IMF Tune v5.x and v4.x installations. This allows the installation to convert all configuration settings automatically. Earlier IMF Tune versions can be upgraded by uninstalling the older release and installing version 6 to the same disk location. For a detailed discussion of all possible upgrading/migration scenarios please refer to Upgrading/Migrating to IMF Tune v6.0. IMF Tune v6 will run in 30 day evaluation mode on first install. Following that, extended evaluation licenses will be provided on request. Please note that IMF Tune v5.x licenses will not work with IMF Tune v6. We will be providing free upgrade licenses to users having a valid Maintenance Agreement in the next few weeks.